Here we are going to be looking at TAX and the different types and explain them further. 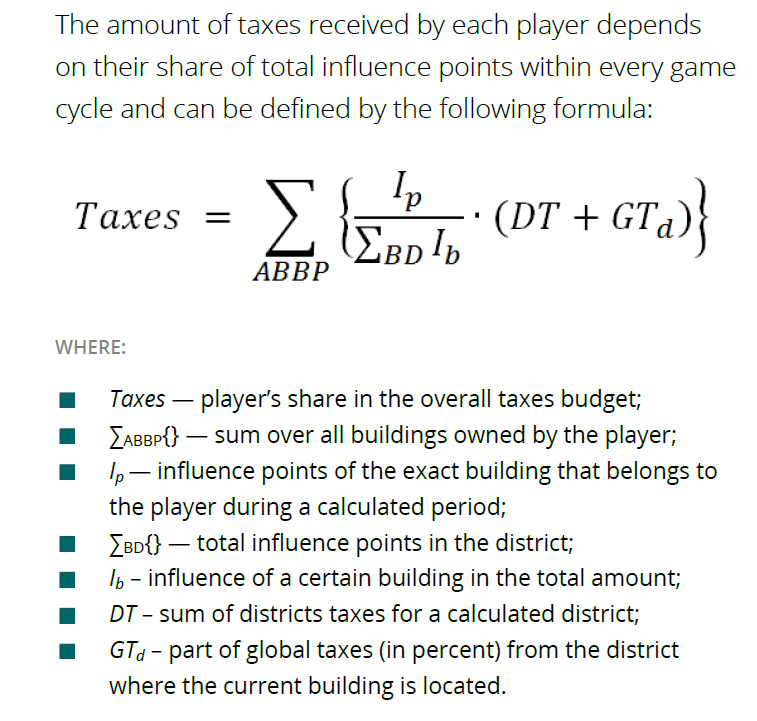 This shows us that the higher the District Influence is, will be a factor to your Influence score. This is quiet interesting because it should mean that being part of a busier, more influential district might be beneficial. It will likely cost you more to purchase land tiles in a busier district and we can see it might be worth doing it. The more you invest could result in the more you receive from the prize pools. It’s all good to own lots of land and receive the neighbour land tile sale commissions but if you want to earn from the District and Global prize pools, you will need to invest in buildings. Throughout this guide it shows how, what and why to construct the properties that should gain you the most influence. 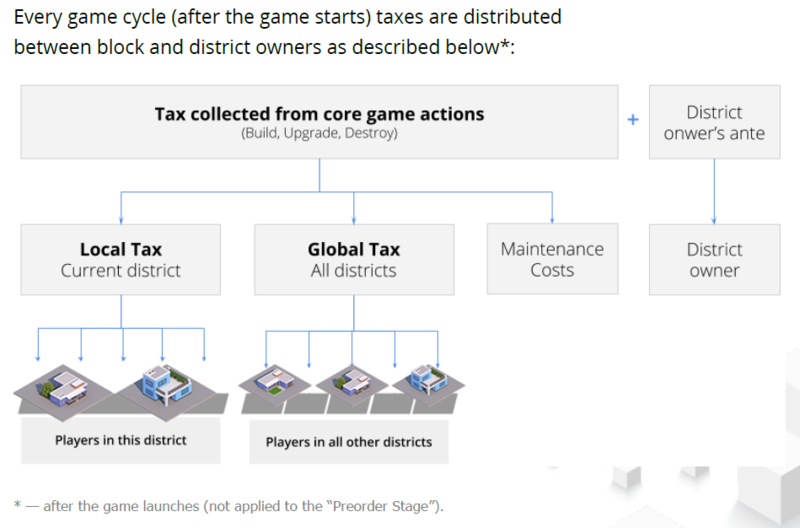 You can see below the tax collection amounts and various buttons. I have tried to illustrate what they mean and what you need to do to get your Ethereum into your Wallet. 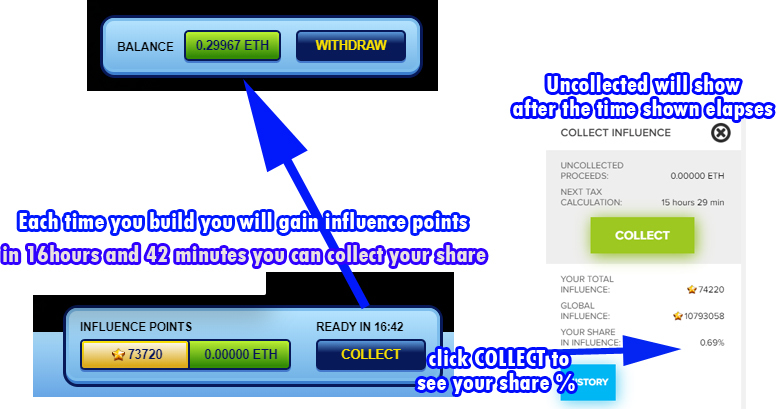 All you need to do is wait for the timer to elapse, and your Uncollected Proceeds will update shortly after with your Ethereum. You can then Collect it! It will then transfer into the top WITHDRAW status bar.. and update your BALANCE. ***IMPORTANT*** you can withdraw this right away or you can let it accumulate each day for upto 60 days (maybe 90 days I will confirm) This will then save you needing to use GAS to withdraw each day. PLEASE NOTE: Each transaction requires a low gas/gwei fee, so each button requires a new transaction on the blockchain.